Anthony Albanese presents himself as a bit of a maverick, somewhat different to other politicians. He’s hosted Rage and has played DJ sets at various pubs across the country. He’s even been filmed skolling beer at local footy games. A prominent figure during the Rudd-Gillard-Rudd years, Albanese’s media profile grew significantly in that time. Since his failed bid for the Labor leadership in 2013, it has gone into overdrive. During the 2016 election campaign, when Albanese’s seat was under threat from the Greens, the Murdoch press rushed to his defence and called on the electorate to ‘Save Our Albo’. A number of figures consider Albanese to be an option as a future Labor leader. Against this backdrop, the Labor powerbroker is the subject of a new biography by Canberra press gallery veteran Karen Middleton. ‘Albanese: Telling It Straight’ chronicles the former Deputy Prime Minister’s journey from the commission housing flats of Camperdown, in western Sydney, to the corridors of power in Canberra. Middleton describes the book as ‘a window on the recent turbulent years of federal politics with a deeply personal dimension’. Unfortunately, it’s not quite that. The political narrative is largely lost to the story of Albanese being raised by his single mother, Maryanne, and the search for his long-lost father, Carlo. It is frustratingly short on politics. Middleton devotes little time to Albanese’s parliamentary career, especially during the Rudd-Gillard-Rudd years. She champions Albanese as a man who plays by the system’s rules. She claims Albanese can work with anyone, earning him high praise from former Prime Minister Kevin Rudd and even Liberals like Joe Hockey and Christopher Pyne. There is no doubt that Albanese’s upbringing had a big impact on his view of the world. He was raised with “three great faiths: the Catholic Church, the South Sydney Football Club and Labor”. Middleton describes how Albanese’s mother encouraged his interest in politics. ‘Her devotion to the Labor Party’, Middleton says, ‘meant that he had little hope of escaping it’. Albanese talks with pride about joining Labor as a teenager because they didn’t ‘just protest’. He rejected the far-left because he thought that ‘Trotskyist groups (were) ultimately too ineffective’. In excruciating detail, from factional fights to lost loves, Middleton records Albanese’s rise through the Labor ranks. Before becoming an MP in 1996 he was involved in campus politics at the University of Sydney. He also worked for NSW Senator Tom Uren and was for a time the Assistant General Secretary of the NSW ALP. So far, the height of Albanese’s parliamentary career has been serving as Leader of the House under Kevin Rudd and Julia Gillard. This however is barely mentioned. The leadership coups of 2010 and 2013, where Albanese played a key role, are framed around personality rather than politics. The 2013 leadership contest against Bill Shorten – where Albanese won a majority of the membership vote but lost the Labor caucus vote – is framed in a similar way. In reality this book reaffirms that Albanese, despite his maverick image, is just another political careerist. Albanese does not have the record of a Bernie Sanders or a Jeremy Corbyn, and poses no threat to the status quo. That said, he is clearly a skilful operator able to speak out of both sides of his mouth. While a safe bet for Labor’s big business backers, he also has the ability to relate to working class people. In the face of Australia facing a deep political and economic crisis, the establishment will be looking for MPs like Albo who can be used to play the populist card. A Liberal government carrying out unpopular measures has the potential to provoke workers into struggle, whereas a potential Albanese Labor government using populist rhetoric could be somewhat better placed to keep a lid on things. 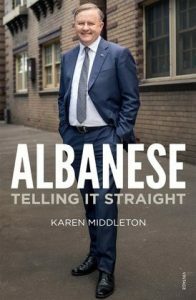 While not a thoroughgoing political work, ‘Telling It Straight’ is an attempt by Middleton to position Albanese as not only a future leader, but as a potential saviour of the system. While parts of the establishment will look to populist Labor figures like Albanese, it is by no means a sure-fire plan. As the situation sharpens working people will begin to lose patience with Labor, and no amount of superficially populist language will save them in the long term.